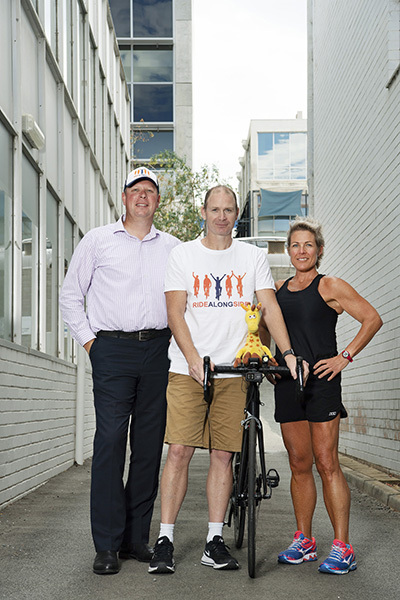 "That's why I Ride Alongside"
Tara Brown, Jason Barnes and Rob Seaman with team mascot Garry the Giraffe. Ten years ago, Senior Constable Tara Brown was putting the final touches on a nursery for a new baby girl about to join the world. The new cot was built, tiny baby clothes were washed and a blanket was ready to wrap the child when she was finally in her mother’s arms. The parents-to-be, Tara and Todd, were so excited to meet their first daughter and bring her back to the nursery they lovingly created. But tragically, that day would never come. Tara was 9 days overdue before doctors decided to induce her, she explained. On the day Tara was meant to deliver her daughter, doctors decided to wait one more night. Sadly that night, Tara’s baby died in utero. It was on Tara’s 33rd birthday that she had to deliver baby Polly, who was stillborn. “So instead of having a baby the next morning, I was planning a funeral,” Tara recalls. The tremendous grief that Tara felt after losing baby Polly was immeasurable. She said the grief was so powerful, it took her breath away. “It was intense, absolutely earthshattering,” she said. It took Tara three months before she was ready to return to work at Mandurah Police Station. “My colleagues were incredible at that time, they supported me throughout that time and continue to do so. My Supervisors were hugely supportive. I couldn’t thank them enough. We hear about how the Agency works in various ways to support their people, in my experience, they were very understanding,” Tara said. Tara’s return to work helped her return to some sense of normalcy. She also turned to physical exercise to help her cope with the emotions that came with grief and loss. “I’ve always been active, but probably after Polly died, I needed to re-frame my attitude and I started to become more active then because it gave me a reason to get out of bed,” she said. In the 10 years since Polly died, Tara went on to have two more children but it has been this milestone year of Polly’s passing that was the catalyst for Tara to become involved in Ride Alongside. Tara said she wanted to do something positive in Polly’s memory and also to speak to others about the importance of looking after your mental health, particularly though physical activity. “My experience of grief is part of the fabric of who I am. It impacts on how I live my life and how I do my job. I accept that. I choose for it be as positive an influence as possible. I acknowledge that processing grief and trauma is different for everyone,” she said. 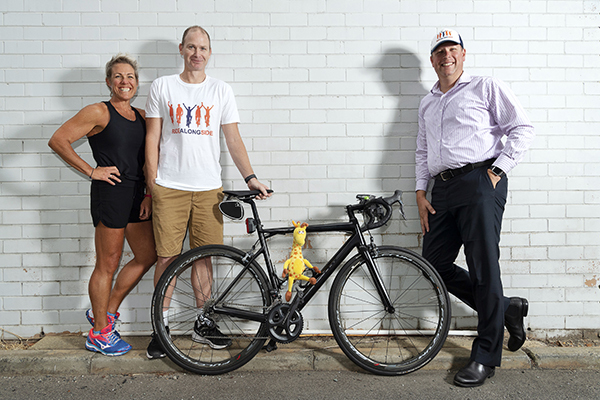 Ride Director and President of Ride Alongside Rob Seaman, who is a former WA police officer, said he hoped the 2019 ride would emulate the large success they had in 2017. “We spoke to about 60 to 70 officers along the way, plus we spoke to members of the community, local council, volunteer firefighters and ambulance officers about mental health,” he said. This year’s ride has a number of new challenges, including those which come with the good problem of having double the number of participants. There will now be a minimum of two support vehicles to usher them on their 500km journey and riders will be camping roadside. “The riders are giving up quite a lot but they are also really passionate about the cause we are doing it for. If they haven’t been touched by mental health issues in their workplace or personally, they will have known someone. They really want to go out make a difference,” he said. Ride Alongside Secretary and Ride Captain Detective Sergeant Jason Barnes said Ride Alongside was a unique way to raise awareness of the importance of keeping mentally healthy. “Rob and I have both worked in country stations. You live and breathe with the guys you work with and you take a lot of that home and sometimes you can feel a bit isolated,” Jason said. Jason said the ride was about getting people to speak out about ill mental health. Getting back on the bike, both metaphorically and physically, is a challenge Tara has taken up with strong determination. “Most of my training is done around school hours and shift work. I generally train from 4am when the kids are in bed on the indoor bike. Then I also try to get outside on the bike where I can,” she said. But Tara won’t have to worry about being left behind or not keeping up on the ride. Jason said the group rides at the pace of their slowest rider and support each other. “It’s not a race, everyone rides together and that’s true about our policing background; we stick together,” Jason said. And it is that camaraderie that the Ride Alongside team is all about when it comes to mental health. “We’re a big family, so we all need to look out for each other,” Jason said. Bunbury Police Station to Boyup Brook via Donnybrook. Boyup Brook to Kojonup, via Lake Towerrinning, Moddiarrup and Albany Highway. Kojonup to Katanning, then onto Gnowangerup via Broomehill. Gnowangerup via Tambellup to Cranbrook. Cranbrook to Mount Barker, then to the official finish at Denmark Police Station.